We live in an era of unprecedented technological, scientific and financial resources. We frequently see incredible innovations - just look at gene editing techniques and the possibility it provides to cure rather than just treat conditions like blindness or respond to the increasing threat of antimicrobial resistance. I remain optimistic about the future, yet the risks to our world are increasing not reducing. They are systemic in nature and require a collective will to address them. Unfortunately, this is happening at exactly the time that nationalism, protectionism and populism are rising, and rules-based multilateralism is declining. I fear we may squander the opportunity to move towards a more sustainable, equitable and inclusive future. As a business leader, a member of our society and a parent, this makes me deeply concerned about the future we may leave for the generations to come. We must act together and we must act now. Environmental risks, which have grown in prominence over the 13-year history of the Global Risks Report, are an area of particular concern. 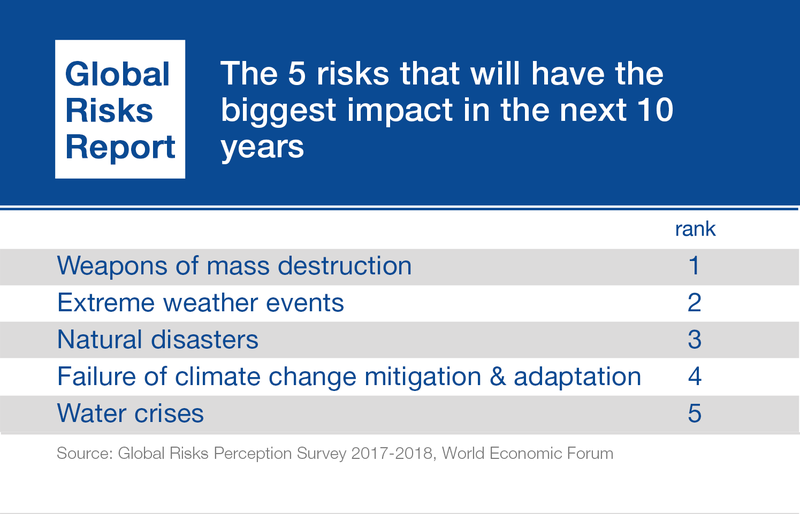 The Global Risks Report 2018 looks at five categories of environmental risks: extreme weather events and temperatures; accelerating biodiversity loss; pollution of air, soil and water; failures of climate change mitigation and adaptation; and risks linked to the transition to low carbon. All of these risks ranked highly on both dimensions of likelihood and impact. This is not surprising: September 2017 was the most intense month on record for extreme weather events, as well as the most expensive US hurricane season since 2005 with economic losses in excess of $300 billion. And the US was not alone in experiencing extreme weather: Ireland, for example, had its worst tropical storm in more than 50 years. The past year is also among the three hottest years on record and the hottest year without an El Niño ever. As a consequence, 2017 was marked by major wildfires in the US, Chile and Portugal, leading to significant economic costs and sadly more than 100 deaths in Portugal alone. Rising temperatures are a major risk for agricultural systems, in particular, monoculture production. There is now a 5% chance per decade that natural disasters could cause a simultaneous failure of maize production in China and the US (which together produce 60% of the global supply), leading to widespread famine and hardship. In 2017, German researchers found that there has been a 75% fall in the population of insects critical to food systems in the past 27 years, raising fears of “ecological Armageddon”. The primary driver of biodiversity loss remains human destruction of habitats for farming, mining, infrastructure development and oil and gas production. The increasing demand for meat is becoming a significant risk for environmental and agricultural systems. Pollution is today responsible for one in 10 deaths globally as 90% of the world’s population lives in areas with levels exceeding WHO guidelines. The creation of more megacities will only advance this trend. New studies showing that plastic waste in the world’s water is finding its way into humans are also of concern. Micro-plastic fibres are being increasingly found in food and water. The concern is that they could bind to toxic pesticides or metals, providing a route for them into the body. In 2017, CO2 emissions rose for the first time in four years as higher temperatures led to increased energy consumption and extreme droughts exacerbated a switch from hydro to coal-fired power generation. Oceans continue to get warmer, and their capacity to absorb CO2 may be declining. Compounding this, research suggests that tropical forests could now be a net carbon source, largely due to degradation and deforestation. 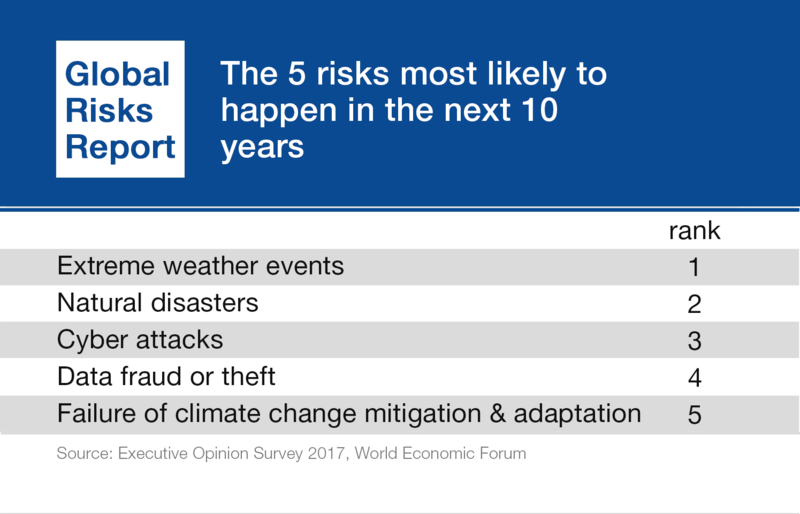 New risks are also expected to arise as the transition to a low-carbon and environmentally secure world speeds up. Dramatic changes in the way energy is produced are likely to trigger economic, societal and geopolitical risks across countries and regions. Unfortunately, too little has been done to mitigate climate change and there is little hope that this will change anytime soon. Our own analysis shows that the likelihood of missing the Paris Agreements target of limiting global warming to 2ºC or below is greater than the likelihood of achieving it. This is likely to exacerbate the impact of global environmental risks. This year’s Global Risks Report also reflects increasing concerns about the economic impact of new technologies, especially as a driver of inequality. Two of the most closely interconnected risks are “adverse consequences of technological advances” and “high structural unemployment or underemployment.” In addition, the current patterns of innovation also threaten the viability of the “escalator to higher income levels”, pushing industrial workers into low-end service sectors. Artificial intelligence (AI), for example, presents many opportunities but short-term incentives might lead to the use of emerging technologies in ways that cause irreversible harm, such as using AI-piloted drones to wipe out large proportions of global fish stocks. New global governance norms and institutions are needed to prevent destructive use. AI is also linked to the spread of misinformation through social networks, which remains highly relevant for 2018 as “fake news” has now acquired global prominence. These risks and others explored in the Global Risks Report 2018 are so structural and interconnected that they threaten the very system on which societies, economies and international relations are based. In such a context, caring for business and our future means considering everything that could affect it. Effective risk management requires us to take the interdependencies between risks into account and demands a truly holistic risk management approach with an awareness of our cognitive biases. It’s not too late to build a more resilient tomorrow but we need to act with a stronger sense of urgency.